The Ambassador of Chile, Patricio Pradel, is a well-known diplomat of Chile. His studies in law and political science have made him a successful diplomat, and he has worked on diplomatic and international missions in numerous countries around the world. Good morning, your Excellency, you have been the representative of Chile here in Germany since last June. Have you enjoyed your position so far and what has been the main focus of your work since you began? Perfect. Look, I arrived here last June and I had to present the letter of credentials to president Gauck. Afterwards, I had to travel with president Gauck to Chile for a very successful three-day state visit, which allowed to increase the historical ties we have with Germany. Chile has a long and traditional history with Germany. We share common values in human rights, democracy, fight against poverty, social inclusion, environment and culture. 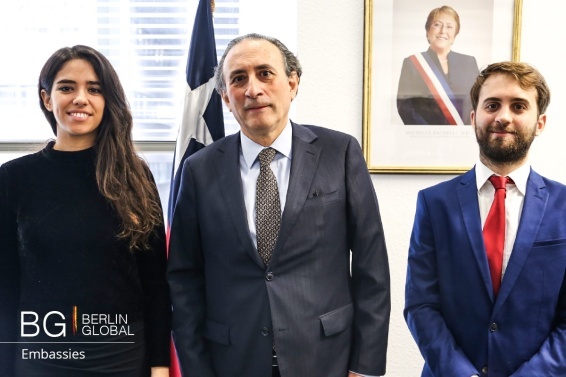 There are series of issues that we have been working for many years, so there is a solid relationship and permanent contacts between Chilean and German authorities. The president of Chile was here in 2014 and we have had visits of German parliamentarians and Chilean parliamentarians in Germany. Furthermore, German foundations have a historical relationship with Chile. So Chile is not an unknown country for Germany. During your career you have spent time in countries like Trinidad and Tobago and Uruguay. Did you learn anything there that you always keep in mind, perhaps something from the culture of these countries? I am a diplomat, therefore I’ve been to so many countries: Panama, Austria, Italy, Germany. I have also been to Switzerland. In addition, I’ve been ambassador in Trinidad and Tobago, Uruguay, and to Aladi (Sociedad Latinoamericana de Integración). Well, if you ask me about Trinidad and Tobago and Uruguay, these are countries totally different from each other. However, we are countries that belong to the region of Latin America and the Caribbean, both members of CELAC (Community of Latin-American and Caribbean States). Regarding Trinidad, I would say that it is a country with a long cultural tradition. It has a Nobel Prize for literature. It is a country that for us is a bit unknown. It has strong ties to the Indian culture, as more of the 50% of the population is Indian, and the rest is of African descent. Chile was an important country due to its relationship with the countries of Caricon, since Chile buys large amounts of Trinidad Gas. Uruguay is a country with a large tradition, a historical tradition. We belong to a community of countries where we share common values, as well as with Germany. Sharing the same concerns, we have such an intense relationship when it comes to commerce and culture. Both Uruguayan and Chilean artists have a close relationship, either from the point of view of painting, movies, music…let’s say that there’s a common relationship between both countries. I’m very interested the fact that you have diplomatic career, what were your main reasons for becoming a diplomat? I first studied law and I think the motivations were many. I believe that the diplomatic career allows people to know different worlds, meet different cultures and learn the big challenges that humanity is facing, which is a learning process. The fact that we are a country that is far away, for me personally there was this interest in meeting new cultures, new languages and different people, which helps understand other actors and countries. To meet these people and countries allows one to develop tools of analysis. It is different actually being there, getting to know people and talking to them, as opposed to just reading about it in the newspaper. It will provide you a new vision. Do you have another diplomats in your family? Looking at the relationship between Chile and Germany, we would like to know the current situation. 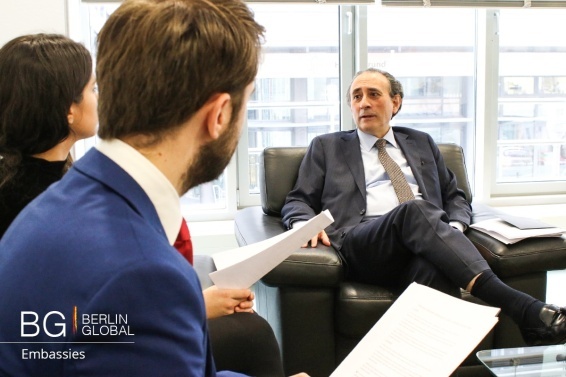 Although you have already told us that it is very good, what do your Excellency think about the areas that might have a room for improvement in the relationship between Germany and Chile, and which areas are already working well? Our relationship is currently very good. Basically, I would say that the two things that we are interested in are: firstly, the cooperation that Germany can offer us when it comes to renewable energies, and secondly when it comes to dual education. These are two topics that we can build on, as well as an increasing German investment in Chile. Although Chile has historical investments from Germany, the more German investments, the better for Chile. There has been a lot of work on this issue. In addition, the exchange between scientists - we have offices at Fraunhofer and also the Max Planck institute working with us, as well as German students who go to Chile and Chilean students who come to Germany. There is also a Chilean scientists network, which has been working for 5 years, which connects with the Chilean students who come to Germany for postgraduate studies. Touching the topic of Cultural Diplomacy, how would you define Cultural Diplomacy? What does it mean to you? How can we use this tool to promote better relationships between countries? I believe that cultural diplomacy is a very important variable for the work of a diplomat and for an ambassador. I think it is a tool that is useful to us and has a wide spectrum as well, because culture is a broad subject area to talk about. And we have different fields: movies, painting, music. In fact, many Germans know a lot of Chileans, such as Pablo Neruda, Gabriela Mistral, Antonio Skármeta, who was ambassador of Chile to Germany. These people are assets. In fact, Pablo Neruda and Gabriela Mistral were consuls of Chile. There is a very close relationship between culture and the literary world. And nowadays we are opening new fields where Chile is becoming a significant actor, with important Chileans in movies, in architecture. Even in the field of music, Germany knows historical singers from Chile, such as Intilmani y Quilapayun and Violeta Vargas. We are going to try to publish a book with songs that are in both German and Spanish. So we have that kind of music and also Chilean DJs in Berlin, such as DJ Villalobos. Indeed! We also have Chico Trujillo, when he comes here everybody enjoys it. They are young people who are coming to Germany, attracted by Berlin. With respect to Cultural Diplomacy as a tool to help solve conflicts, can you provide us an example of your own involvement in a scenario where such tool was useful to solve a problem? For sure Cultural Diplomacy helps solving issues because culture is always useful in strengthening ties. We’ve seen around the world, in different instances, popular concerts for peace, concerts for human rights. Culture also helps bring people together for peace. In many places we’ve heard about these type of concerts, often helped by celebrity endorsement. Furthermore, there were so many Chilean artists who lived in exile and then returned. They have created numerous ties and networks. Could you share with us a personal experience in your career where you can say: “I was involved in solving this with cultural diplomacy”? Something positive to tell. There have been numerous things, because you can help an artist launch his or her movie or book, or to organize music festivals. We are always willing to help host these kind of events. Furhermore, we have a cultural office within the chancellery, jointly working with its network of embassies on these type of issues. We also have the National Council of Culture and Arts, another state entity, which is in charge of spreading Chilean culture around the world. Lastly, as your career is related to international relations, what piece of advice would you give to young people who want to begin a career as a diplomat or in international relations? A piece of advice coming from you, a person with experience in this field. I think it is not always good to give a lot of advice, but suggestions. I believe for a person the best thing to do is to be curious, to represent your country to the best of your habilitéis, and to fight for values such as human rights, democracy, and to respect diversity. That is it.